Earthquake in New Zealand strands tourists and cuts transportation on the South Island. A powerful 7.8 earthquake in New Zealand struck the capital and East Coast just after midnight, stranding tourists and travelers but so far only two deaths have been reported. Stuart Cohen, reporting for NPR from Sydney, said military aircraft will be taking in tons of supplies and ferrying out hundreds of stranded tourists since highways and railroads have been effected. Hundreds of tourists have either been rescued, or are in the process of being rescued. See https://twitter.com/NZDefenceForce/status/798082059319197696. Some are having to be airlifted to safety. 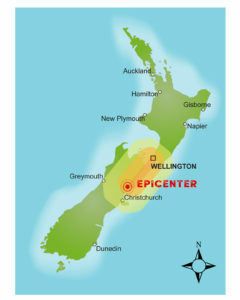 The region between Christchurch and Wellington (the capital), were hardest hit by Sunday night’s earthquake, which also resulted in a small tsunami. New Zealand’s Prime Minister, John Key, called the road and rail issues “horrendous.” Recent heavy rain has also added the risk of land slides (See images at http://www.nbcnews.com/slideshow/major-earthquake-hits-new-zealand-n683551). Hours later, another strong quake measuring 6.4 magnitude struck a popular tourist area in the same region, north of Christchurch. Five years ago, Christchurch endured a series of earthquakes that destroyed the city’s infrastructure, homes and communities. The most violent quake hit on 22 February 2011, killed 181 people. Even though today’s quake on Sunday, November 13th was stronger than 2011, less lives were lost as a result of the epicenter being farther away from densely populated areas. On Thursday, September 1, 2016, another 7.1 earthquake struck near the northeastern coast of New Zealand at 4:37 a.m. (Friday morning local time). Is New Zealand safe for travel? The Department of Tourism for New Zealand says that all airports are currently open. The tsunami warning has also been called off although tourists are being told to stay out of the water and stay away from the beaches affected. The New Zealand Ministry of Defence & Emergency Management (MCDEM) initially issued a tsunami warning for the eastern coast of both North and South Islands, advising those in affected coastal areas to move inland or to higher ground. 6.) Follow instructions of local civil defence authorities. Official travel advice and warnings can be found at https://www.safetravel.govt.nz/. Check the FCO website for updates before your trip and Ministry of Civil Defence & Emergency Management website for up-to-date advice.